Ctec – Analogue and Conventional System. Photain – Analogue Addressable System. 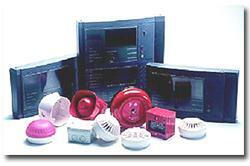 Al our fire alarm systems are installed to BS5839, using Hochiki, Apollo and KAC protocols. H E SERVICES thoroughly service your fire alarm panel as well as checking all smoke detectors and manual call points in accordance with British Standards. Whilst on site we provide a complete record of our actions and offer a 24-hour emergency call out service for all our maintenance customers.